Raw coconut oil has a truly spectacular nutritional profile. It has a deep and exotic aroma of coconuts. Below 76 degrees, it is a white solid; above it is a clear liquid. When melted, it is a lightweight oil that is readily absorbed but can leave a slightly oily finish on the skin. Coconut oil is particularly rich in antioxidants. It is one of the most nourishing oils for the skin and is almost a must-have in hair care products. Coconut oil is also heavily used in soap making for its superior lathering qualities. However, some allergies do exist and the oil can clog pores for some sensitive skinned people. Use sparingly in facial products. Also, keep in mind that the viscosity change with temperature, so plan accordingly. Modern studies have shown coconut oil to help control weight, boost immune function, help control type-2 diabetes, ease digestion problems, and curb sugar cravings! 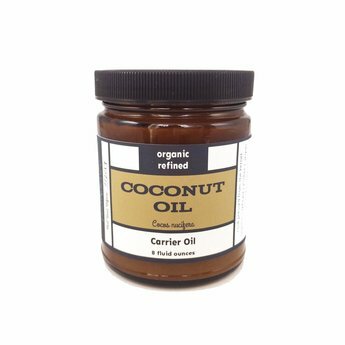 Coconut Virgin Organic Carrier Oil should be kept cool and out of bright light; refrigeration is recommended, and it should be used quickly to retain its freshness. Once properly formulated, however, it is slow to go rancid.